Thank you for the invitation to participate at this event launching the Austrian Presidency of the EU Council in Bucharest. On behalf of the Romanian Government and of the Romanian Ministry of Foreign Affairs, I warmly wish our Austrian friends the best of luck in achieving their mandate. I would like to take this opportunity to also thank Bulgaria for its excellent work over the past 6 months, as holder, for the first time, of the EU Council Presidency, and to thank, as well, the Representation of the European Commission in Romania for hosting today’s event. Romania and Austria will be holding, successively, the Presidency of the Council of the EU. This gives us an excellent opportunity to work together in order to consolidate the European project and to advance the European agenda to the benefit of the European citizens. Austria’s pledge to act as a bridge builder represents an approach that we fully share and we stand ready to coordinate and find common solutions to the most pressing issues the EU is currently facing. A Europe that protects – the motto of the Austrian Presidency – can only be achieved if common goals are pursued at European level, through pragmatic and consensual European policies, responding to the expectations of all our citizens. I am confident that our continuity as EU Council Presidencies will motivate us further to pursue this objective, in cooperation with the other Member States and the European institutions. You can count on Romania’s support in achieving the priorities included in your Program. In our view, it is essential to make all the necessary efforts to enhance the European unity, cohesion and inclusiveness, building on a pro-European stance. This is the very spirit in which Romania is preparing to host the European informal Summit in Sibiu, next year, on the 9th of May 2019. During the Austrian Presidency, Romania will be exercising the role of “shadow Presidency”, whith Romanian experts participating, together with those of Austria, in negotiations that involve the current Council Presidency. This reflects Romania’s engagement towards ensuring the continuity of the European agenda and of the work on different European dossiers under negotiation, thus ensuring a mutual support and a smooth transition towards the Romanian Presidency and our next Trio (Romania-Finland-Croatia). Preparing the European Union for a new Multiannual Financial perspective is a considerable task for the period to come. We are all fully aware of the importance that financial predictability plays in further implementing our common political objectives at EU level. The Bulgarian Presidency has made a considerable effort in ensuring a swift start of the discussions on the next Multiannual Financial Framework, based on the proposals put forward by the European Commission. We count on the Austrian Presidency to take further this work in the upcoming months and set the path for a constructive and substantial negotiation process aiming at a timely and comprehensive agreement on this dossier of major importance for all of us. As Romania will take forward the legacy of these negotiations, as future EU Council Presidency, we count on the good cooperation and dialogue with the Austrian Presidency in ensuring the needed continuity and consistency of this process. From our perspective, it is important to ensure that the next EU budget provides for a balanced solution allowing proper financial support in order to advance the convergence process, mainly with the support of the Treaty based policies – the cohesion policy and the Common Agriculture Policy, as well as accommodate the new priorities and challenges the EU is facing. As revealed by the latest months’ developments, as well as by the decisions formulated by the European leaders in June, migration and the EU internal security continue to be considerable challenges for all of us, which call for further steady attention and efforts. We welcome the fact that the Austrian Presidency is prepared to fully engage in this area and that the objectives related to the external dimension of migration and the EU external borders are high on its agenda, as a consistent part of a comprehensive approach in this area. Romania, since the beginning of the crisis, has pleaded for measures aiming at tackling the root causes of migration in order to ensure a long term efficiency of the EU action. We should continue on this path, through further enhancing cooperation with origin and transit third countries, streamlining return and readmission policies, strengthening the EU's external borders, and increasing attention on all migration routes. However, advancing on the reform of the European asylum and migration policy remains a considerable challenge for the period to come. While reiterating our constructiveness in the follow-up of these discussions, both as EU Member State and as future EU Presidency, we keep encouraging that a solution in this process should be build upon a consensual and positive basis. 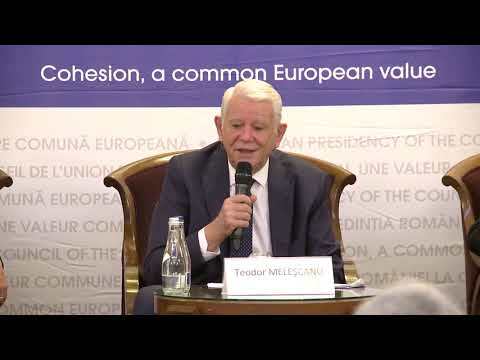 The accession to the Schengen area of Romania and Bulgaria remains an important political objective for us. A positive decision in this sense will contribute to an increased effectiveness of the measures aiming at reforming the Schengen Area and consolidating the EU internal security. We appreciate the priorities of the Austrian Presidency in the field of security and defence. For Romania, the process of strengthening the EU's role in the field of security and defence must be an inclusive, coordinated and complementary approach, going hand in hand with developments taking place at NATO, in order to avoid unnecessary duplication, as the North-Atlantic Alliance remains the main guarantor of the collective defence of its Member States. We are ready to continue to work closely together on these issues, considering the Romania’s Presidency of the EU Council in the first semester of 2019. We share the view that the Western Balkans and the Eastern neighbourhood need to remain high on the EU agenda. Romania and Austria share a common view on the role of the enlargement policy as an investment in strengthening peace, security, prosperity and stability on the whole continent. Following the recent EU Council Conclusions, that recognized the efforts of the candidates and welcomed the progress achieved in this respect so far, we will continue to promote enlargement as one of our priorities during the Romanian EU Council Presidency. We will also work together in order to promote the Eastern Partnership as a pragmatic, inclusive, result-oriented cooperation framework, helping us to bring our Eastern neighbours closer to the European Union. We also trust that the Austrian Presidency will highlight the importance attached by our countries to the added value of the Macroregional Strategies, such as the European Strategy for the Danube region - a common Romanian-Austrian initiative - for ensuring social-economic cohesion and sustainable development of the region. That would fit into the current European debate on the next EU Financial Framework, in order to ensure the proper financial allocations to the priorities set by our countries. Assuring you, one more time, of our constant support and engagement, allow me to wish you, dear Ambassador, all the best in fulfilling the mandate of the Austrian Presidency!